Being a cross sectional study, using Human needs and peace research theories, this book provides an analysis of Mt. 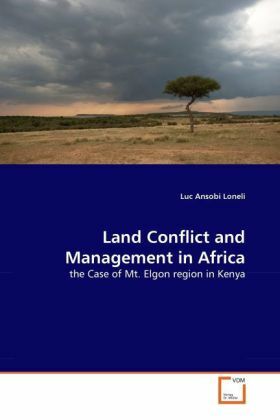 Elgon land conflict in Kenya in terms of its causes, actors involved as well as the managerial approach that would help dealing with dysfunctional effects of the conflict. Because Peacebuilding must be rooted in and responsive to the experiential and subjective realities shaping people's perspectives and must be moved from the concern with the resolution of issues toward a frame of reference that focuses on the restoration and rebuilding of relationship. Also the potential of constructive conflict is to produce positive personal and social change so as to foster stability within any given community, the author analyzes reconciliation as the central component of peace-building as well as framework that would help address and engage the relational aspects involving the local communities. Finally, the author provides some policy recommendations for the sake of sustainable management of the land conflict.